Gary Illyes, a Google Webmaster Trends Analyst, was speaking at Brighton SEO today, discussing the upcoming mobile friendly ranking signal that will be starting on April 21st. And he had some interesting things to say about local businesses at their pack listings. 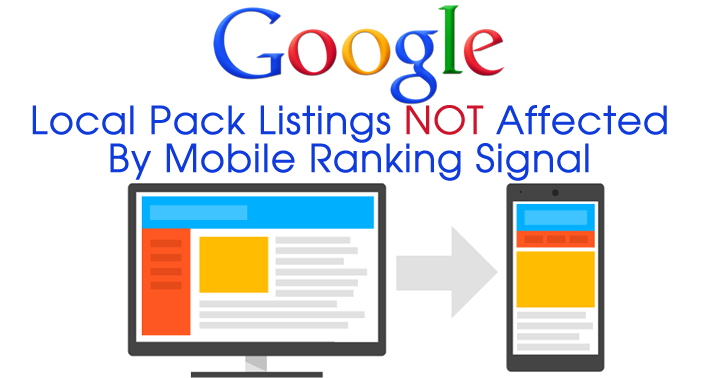 According to Illyes, if a local business is appearing in the Google Pack results, but does not have a mobile friendly site, their listing in the Pack results will NOT be impacted. Those Google My Business listings will remain. It does make sense in one way, as often times when people are viewing listings in a pack, they aren’t necessarily looking for a website, but they might be looking for the address or phone number. And especially when location targeting is used, it doesn’t make sense for Google to omit a perfectly targeted result – especially if it is located just down the street from the searcher on a mobile device. Also, many local businesses don’t necessarily put the same emphasis on mobile friendliness, especially if they offer a bare bones site that is more a vehicle for offering store hours and location information, rather than a site featuring product listings and details. So if you have a local business, if you are appearing in the pack results, you don’t need to worry about losing your pack listings. That said, it is still a good idea to work on making those sites mobile friendly, especially if changes in rankings result in the business no longer appearing in those pack results, or if the pack results for some of the search queries no longer display. Update: There is also more information on this new mobile ranking algo, and how it only applies to the “ten blue links”, according to Gary Illyes. That said, the individual product teams – including the one for the local results – can apply their own mobile algo or signal to their results. But this particular mobile friendly ranking signal coming into play on April 21st is strictly for the organic “ten blue link” search results and not the pack listings or any other components on the page such as In-Depth articles and In the News features. This is great to hear!. Thanks Jen! I shared at the Local Search Forum so everyone knows.